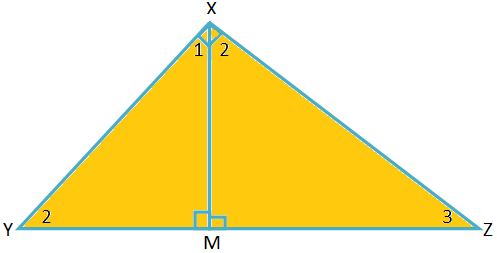 Here we will prove that in a right-angled triangle, if a perpendicular is drawn from the right-angled vertex to the hypotenuse, the triangles on each side of it are similar to the whole triangle and to one another. Given: Let XYZ be a right angle in which ∠YXZ = 90° and XM ⊥ YZ. Therefore, ∠XMY = ∠XMZ = 90°. To prove: ∆XYM ∼ ∆ZXM ∼ ∆ ZYX. (i) ∠XMY = ∠YXZ = 90°. 2. Therefore, ∆XYM ∼ ∆ZYX. (i) ∠YXZ = ∠XMZ = 90°. 4. Therefore, ∆ZYX ∼ ∆ ZXM. 2. By AA criterion of similarity. 4. By AA criterion of similarity. 5. From statement 2 and 4.